Google Search Console (or Webmaster Tools - if you still in the habit of calling it this like me) is an essential tool in every SEO's toolkit. The data and information we get from it are invaluable. The Search Analytics Data showing the keyword performance of a site is key to accessing the site's organic visibility success. Furthermore, only three months of data is available at a time, so if you do not do a full export regularly, there is no way of getting back historical data. Or you can open Google Sheets and search for the plugin directly by choosing "Add-ons" >> Then "Get add-ons" from the Google Sheets Navigation. Once the installation is complete, open the Search Analytics sidebar by selecting it from the Add-ons menu. The sidebar will open and you can configure your export. From the Requests Tab Choose the site you would like to generate the Search Analytics export for. Select search Type: Web, Images, etc. Add Filters if desired, this will be based on the groupings you selected above. 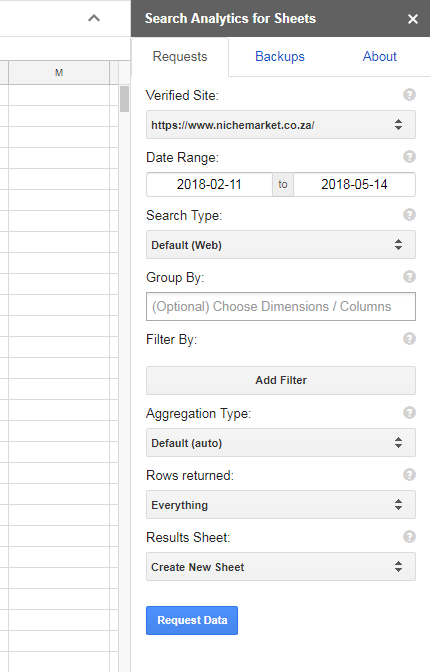 And just like that, you will have generated a fully populated spreadsheet with all the Search analytics data in the format you require. The add-on also allows you to set up automatic backups as frequently as you desire. 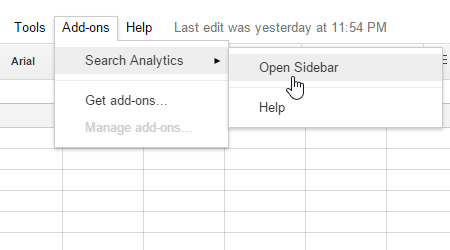 Choose the backup tab on Search Analytics for Sheets Sidebar and configure as desired. If you have any questions or would like to know more about this nifty add-on or Search console, comment below or feel free to contact us here!